Violette in Love, by Parfums de Nicolaï, came out in 2009. I can't remember when I first tried it, but I think it wasn't until much later, possibly the following year. At any rate, I thought it was pretty but maybe too charming for my taste, and I set it aside. Now, there was a time when I tried almost everything — everything I didn't absolutely detest, anyway — at least a few times. Many fragrances I tried more than that. I might have worn the same fragrance, off and on, for a few weeks: lived with it awhile, in other words, before deciding what I thought of it. Those days are long gone. It is not just that there are too many fragrances, practically speaking, to spend that much time on each one. It's also a psychological effect, distantly related, perhaps, to the well-documented studies that show that more choice does not lead to more happiness: when there are so many fragrances, it seems less important (to me, anyway, slacker that I am) if I miss one or two gems. I know I can't find them all, but surely I'll find plenty of other gems. So Violette in Love got only one shot, maybe two, and then I filed it away. Later, I saw a few mentions of it here and there (Erin called it "just nice" when she reviewed L'Eau Mixte), none of them glowing. I don't know exactly what made me fish the sample back out of oblivion a few weeks ago, but I was thinking about violets for reason, and lamenting that I no longer have any Borsari Violetta di Parma, and wondering if I should buy that new 20 ml size of Balenciaga Paris (which I have not yet posted about). And Violette in Love came to my mind, and next thing you know I was wearing it, and I was quite taken. It seemed like L'Artisan Drôle de Rose (or its heavier cousin, Parfums de Nicolaï's own Balkis, which appears to be sadly discontinued) in reverse, with the violet front and center and the rose behind. It was still charming, but now it was charming with a sly smile, and the overdose of raspberry lollipop in the opening made me happy instead of making me wrinkle my nose, and I was willing to second the brand's description of "modern and shimmering", and all the rest. I have long since (mostly) given up buying things right off the bat, but all the same I was tempted by the reasonably priced small size (30 ml, shown below, $45). And so it seemed the next time I wore it. Then, I wore it again, and the raspberry note really seemed too heavy and too fake, and the musk in the base too heavy and too sour, and I could not even find the "just nice" part. I've worn it several times since then, and the results have been mixed. I give up. 1. Assuming you don't make up your mind right away, how many times do you try something before you give up? 2. Have your testing habits changed as the number of new fragrance releases has risen? And of course, do comment on Violette in Love if you have tried it. Coming up on Thursday probably next Tuesday: a review of Parfums de Nicolaï Kiss Me Tender. Parfums de Nicolaï Violette in Love is a limited edition, and the notes include lemon, pink pepper, raspberry, blackcurrant, rose, violet-iris accord, coriander, black pepper and musk. It can be found in 30 and 100 ml Eau de Toilette; for buying information see the listing for Parfums de Nicolaï under Perfume Houses. 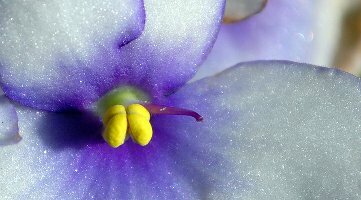 Note: image is african violet by ankakay at flickr; some rights reserved. I can’t really answer 1. If I hate something, I move on. If I love it, I add it to the list. If I’m unsure… well, it depends. If it comes up for split, or there are discontinuation rumors, or a scent sibling praises it, I’ll pull it out and try it again. But I’ve definitely hit overload, and there are enough things I DO love that I don’t worry much about ones that I don’t. As for 2: Gone too are the days when I tested each sample thoroughly, writing down my impressions and such. Now, I smear a bit on the back of my hand; if it doesn’t grab me, I toss it aside in favor of the next one. My untested and semi-tested samples are now in the 100s, and I’ve pretty well stopped looking for more (though of course I don’t turn away those sent by friends, or as split extras :D). It’s less about the number of releases, though, and more about how hectic my life is these days, and how many really lovely fragrances I already have at my disposal. I was never meant to be a perfumista proper; I’m just a scent enthusiast with dwindling time and resources. That is so interesting — that you’ll try something because it is available in a split. I can’t even imagine trying to keep track of what is up for split! Let me know what you want to keep on the lookout for and one of our “professionals” will keep in mind to alert you if anything pops up. We’re very good that way. You may end up sorry you said that! Oh, but it all depends on which cost you think of. Personally, I choose to think of the cost of a split vs the cost of the whole bottle I’d have to shell out for otherwise, if I decided I wanted some. So true, but there are zillions of things I never buy at all because I just don’t have time to look into finding small quantities — and I have no intention whatsoever of paying for a whole bottle. …and that’s why I’ve mostly quit with the splits. While I was building a collection, though, it was the way to go. Now I just need to weed out the mistakes and see where I sit. If someone could rattle off the top of their head the split sites people favor I’d be appreciative. I’ve read all the articles regarding splits but I keep hearing of other sites and it seems they change often? I’m on mua now (god help me…) and the scentsplits wiki site, but i need more! For both purchasing and swapping… If anyone feels like mentioning a few. Robin – I only dabble in the very rare or super $$$ with the splits groups. It is too much to keep up with splits for everything else, though occasionally I bite. It is a useful tool for testing new new and expensive that I’ll not likely buy anyway. I have too much that I already enjoy wearing as it is. As Joe said one time a long while ago: 5 mls of most things is plenty. If I really love something I’ll get a large decant of FB. Ditto all that Boo said. I’m in the same boat. Very timely topic, as I am testing two of the Montale Aouds for the third time each. Today is compare and contrast day, and they both smell differently than when I tested them solely. I find that I wait to accumulate a few scents from the same house and test them on consecutive days, just seems more organized to my usually random mind. As to the incredible number of new releases, I find that price (Xerjoff) and line confusion (Boadicea has one of the most overwhelming websites ever) will cause me to refrain from trying anything from that brand unless it fell into my lap! Xerjoff Richwood has been getting great reviews but @ $635 for 100ml the ridiculous meter is reading off the charts!!! Oh, very much true for me too on price, and for me also just the sheer size of the line: even if Boadicea got their act together in terms of presenting their line, I wouldn’t care. I’ll try the ones that come my way but no interest in being comprehensive if they’re going to make so darned many. It’s the same for DSH – about one time each year I’ll decide to dive in and then my head starts spinning from the poorly organized website. I’ll try maybe 3 or 4 each year b/c I think the fragrances are meritous, but that site. OY! At Xmas time, it took me ONE HOUR to locate 4 samples I wanted. I had to google into the site by name of the fragrance. By the time I went to check out, my cart had been erased. Oh, I do know what you mean. The website is not what it should be. I forgive DSH because she’s indie and she isn’t pretentious. I forgive her too, lol. I just decided to call on the phone and order the old fashioned way. They were very nice and I got to personally select the extra samples they through in. So from now on I’ll order from them on the phone. I can’t wait to retest Viridian in the spring. 1. Usually twice. If I still don’t like it, the sample becomes a swap extra for someone else. Maybe they’ll love it. 2. I don’t know if my habits have changed due to the number of releases, but I definitely sample a fragrance fewer times now that I’ve been at it for a while. When I first discovered the world of niche perfumes, I would sample a vial of Serge Lutens (or Malle, or fill in the blank) over and over, even if I didn’t particularly like it, trying to find the magic in it that MUA or blog reviewers did. There must be something wrong with me if I don’t appreciate all Lutens as a stunning work of art, right?! I’m past that stage now. In fact, fragrances have gotten so expensive in the last eight years that I’m often relieved when I don’t fall for the new release that has all the reviewers excited! It’s funny – Kiss Me Tender was my most recent sample. I didn’t like it the first time (what is that strange green vegetal note that never fades, and where is my hay? ), but the next time I found it tolerable. I did enjoy the anise quite a bit. Something about it reminded me of Myrrhe Ardente, even though I’m not sure they have any notes in common. Can’t wait to read your review! Oh, ditto on #2 — I no longer care if I’m missing the splendor everyone else sees. Life is too short. Totally agree! And I think often times, people talk themselves into smelling splendor just because they perceive the crowd thinks a scent is wonderful. Sometimes, as the case with perfume, I will need to get away from the counter and/ or samples bag for awhile, perhaps walk around and come back to it. Overall, I say perhaps twice. As far as my testing habits, the only thing I have changed is that I try to look inconspicuous when I pull forward my shirt and apply. I like to try this area out as fragrance seems to smell somewhat different on me in that aspect. I completely missed Violette in Love, but based on your description, I will not be rushing to find a sample. The main thing that changed for me with the increasing number of launches is that I no longer worry about trying to catch up on every single release. It does not bother me, because I know that if some new perfume is of any interest, either a blog review or a comment from a friend will alert me to it. Yes. I totally ignore even some “important” launches & figure I’ll try them eventually or not, what’s the difference. I will give most samples 2 or 3 tries before they go into the “swap extra” basket. However, at the rate I’m going, I will never get through my “untested/tested once” basket of samples! I’ve only bought samples once or twice, but have gotten so many through swaps and stalking at Sephora/Nordstrom/Hermes/etc. I’m still pretty new at all this, maybe a year or 2 in, so I’m not even worried about new releases – I’m just catching up on everything that is out there! Oh, I will never get to them all either. I’m thinking of doing a major clear, and getting rid of everything that’s been waiting for over a year. I have probably about 50+ samples I’d like to clear too. Maybe we can do it as part of a NST swap? Sample mixed lot, no questions asked. Eh. I’ve always been a bit prone to whim. If I like something I’ll probably (but not always) get it or try something else in the same vein. If I don’t, I don’t. Price, name, “cachet”…none have ever really mattered much to me. I used to subscribe to the known name/highly prized brand=greater quality, but the recent death of any noticeable difference in quality (not to mention quantity of pigment, recently) in premium vs “drugstore” makeups has just confirmed my already strong bias towards paying more attention to what result I get, and less to what name I read off the bottle. (case in point, I was a MAC girl…then for a while was L’Oreal HIP girl…now am wandering through the land of lipstain hell waiting for someone to come out with a lipstick that’s not screaming !!!RED!!! at me and isn’t a sheer, a high shine or a frost…oh, excuse me, pearl.) A lot of the same thing seems to be happening or at least coloring my perceptions when it comes to perfumes, although I’ll admit, I was never a big seeker in the first place, not having a good handle on “girl” things. Well except for that stupid thing that changes my body chemistry once a month. That thing I’ve got too much of a handle on. *sigh* And the way it makes some things that smell perfectly nice (and nice on me) the rest of the time induce migraines and dry heaving. This is offtopic, but curious since I only pay the tiniest amount of attention to makeup — but take, say, eyeshadow. Even if MAC’s isn’t higher quality, aren’t they just doing more interesting colors than L’Oreal? The used to have many many more interesting colors that I could wear. Unfortunately, like many other brands (who is it that does the Pure Color line, Estee Lauder?) there seems to be less and less of interest (particularly in lipsticks) that I can wear due to skin color and tone. It’s really starting to piss me off, quite frankly. Oh, well. Some of it could be that I’m stuck in Iowa. But I didn’t have any better luck last time I visited family in Chicago and stopped by a MaAC counter. And I’m not even as dark as the cousins out there. Unless I want to be stuck with the smoky eye (I know it’s popular, but I’ve always absolutely detested it) and the lip-colored gloss thing (what the hell is the point in wearing lip color that’s the same color as the rest of your face?) then I’m pretty generally out of luck entirely. If i cant make up my mind… I usually keep going until I make one, and I can usually have a lot of mixed emotions doing it…. It’s when I’m indifferent to a fragrance that I toss them to the side, and quickly… And I am very casual in the way I test, If I’m in the mall, I’ll work my way in to the store and see my people =).. Whereas I do my best to try nothing in a mall — there, I’m usually indifferent to all of it. Oh, but I did not mean I don’t try those fragrances! Not at all, only that I hate trying them while I’m there, I’d much rather get a sample and take it home. And also meant: there is something about the mall that makes even the really good mainstream fragrances seem depressing. I guess i just find the whole beauty section of most department stores depressing. You know Robin, I completely understand that sentiment, and was never able to put it into words… There really is just something about the mall that can almost alter the perception of everything there…. But when I do go, I shop with 1 lady who works the night shift, if she is not there, no dice….. I agree totally! I do have access to a lower tier Macy’s, but I also get depressed when I get there. I rarely go test what little they do have. I think there is so much more anticipation and control over the receipt of samples in the mail! It’s like Xmas every time a package comes. Plus you get the advantage of really testing without interruption or pressure to buy. Oh yes. A lower tier Macys is depressing. But the beauty hall at Neiman Marcus is depressing too, just in a different, costlier, more pretentious way — you know what I mean? It’s almost more desperate. I know what you mean — department stores in general are depressing no matter what you are shopping for. I find the more I shop online the worse I am at negotiating a department store. Hi Robin! I haven’t tried Violette in Love, so have no comment on it, but there are those that I’ve tried, tossed into the reject pile, then dug out again, only to confirm my rejection. Can’t think of any that I’ve rescued and loved after the initial reject. 1. How many times do I try something before I give up? Well, I’m getting more and more selective these days. If something doesn’t grab me on the first try, I pretty much ditch it. And it’s not always something I don’t love. I may think a scent is really pretty or really good, but it may not be good enough to replace something I already have. If I already have a bottle of a similar scent, I tend to let the lesser one go. Exceptions are Guerlains. I’m becoming blind to Guerlains! Like Angela’s post yesterday, I think the name alone makes me want it. If a scent intrigues me on the first try, I’ll try it at least 2 more times before I either put it on my wish list, ditch it, or drop it into the “keep” pile for a possible decant. 2. Have my testing habits changed as the number of new releases has increased? Don’t think it’s so much the number of new releases as it is the number of bottles and decants I now own. I was never able to keep up with new releases. As my bottle count goes up, though, the pool of scents that I want to try has narrowed significantly. I’ve definitely become more focused on certain houses or certain perfumers. I don’t even bother with the majority of mass market scents any longer. Interesting. It might be that the # of bottles affects me in that way too. It certainly affects what I purchase. 1. Assuming you don’t make up your mind right away, how many times do you try something before you give up? Yes, I have become jaded and snobbish.On a new launch… If I don´t like the brand I don´t even bother to try the perfume. this of course may cause me to miss a lot of good things, but it is the way I have found to cope with the deluge of new releases. Nevertheless, once a year when I go on vacation outside Argentina and I stop at a Duty Free Shop, I make a point of going 30 minutes earlier, so I can focus on testing the new releases and travel-only releases that usually are only (or at least at first) available on the airports. I posted something on a fbook group recently about why I keep the number of bottles at 10… I said that if I had let’s say 365 fragrances, as I usually wear 1 fragrance a day, I would surely have to wait a full year to wear something I truly like again, so I am not willing to go that way…. I might go up to 50 bottles over the year, but having too many choices makes me crazy, and I REALLY like the 10 I have right now much enough to wear them. I connected this with your comment on choices. Well sorry for the long post, but I think this issue is MOST interesting. Oooh! I’m curious! What are your ten? I think I’ll eventually settle in to about 5-10 per season. As I use something up, I can either restock or replace. Then I can sample here and there to see what lands on the “when I run out” list. That was my original goal, too. 5-10 per season seems like enough, doesn’t it? With sampling as an extracurricular activity. I would sure like to feel more in control over this whole perfume thing! Gucci Pour Homme II, Outrageous, 888 and 71 from CdG, Vetiver Brasil by O Boticario, Montanna Homme (2001 version), Premier Figuier, Eau Sauvage Fraicheur Cuir, and on the Hermes box two 15mls Osmanthe Yunnan and Brin de Reglisse. I also have a couple of “recurring guest actors” hehehe Verveine agrumes from L’occitane (lovely on this summer months) and Kiehl’s musk and that one I use mostly for layering under the figuier and the verveine. Thanks for sharing your collection! I so admire you for this. “guest actors” – that’s funny! I’ve always been curious about Outrageous! How interesting! I should use paper more. I do in stores, but I always try to get a sample and bring it home and put on skin. I rarely use paper because I usually like to keep smelling it over some hours and I tend to lose the slips quite quickly. Also, weird this, but I keep thinking spraying on paper is a waste. Only a few fragrances are really scrubbers, and sometimes I want to smell even the bad ones for a while just to recheck my response. They may test accords on paper, but they do test trial mods of perfume on skin. Victoria over at Bois de Jasmin did an interesting post on how, when she worked at IFF, she was always being asked if she “had skin” available for testing. I keep my collection at ten as well. I think that might go up this summer though, because the majority of my ten right now are for the cold months. See my post above.. I keep a couple of colognes as recurring stand-ins for the summer months. My collection is hugely seasonal….but I’m finding there are about ten perfume seasons not to mention times of day!!! Yes, I can totally get into a breakfast-lunch-dinner-and evening fragrance, lol!! I admire your balanced and reasonable approach, kaos! I’m glad to see you posted about this because I seem to be in a constant struggle with this predicament-especially with violette in love! I am still pretty new to perfume (I have been lurking on here for about a year), and I wonder if this is part of my indeciseness (I am just not sure what I truly like yet), combined with the desire to mimic a “high-brow” taste in perfume which might yet be beyond my nose. For example, I bought a full bottle of NdT based soley on your review (yes.. I know… it seems like everyone needs to made that mistake once… or twice), and was horrified when I got the bottle. I think I was all too keen to emulate the beautiful description of NdT as coy and mysterious, while not paying attention to the suggestion that it was potentially ‘difficult’ scent to wear. Anyway, my real point is that I got a sample of ViL then, and I wore it enthusiastically over the course of a month. By the end I had talked myself out of a bottle-maybe it was the heat, but something about it seemed plastically, and, as you say, too fake. I recently recieved another one though, and I seem to love it all over again. What might make up my mind? The price, and others’ reactions to it. When I stuck my wrist under my boyfriend’s nose, he said it “was amazing-it does something to him”, and he is not easily impressed (this man insisted Burning Leaves smells like mustard-imagine my indignation). Oh, I did that all the time! My only advice: don’t buy too many things while you’re still feeling indecisive! Build your collection as slowly as you possibly can. ViL is perfect in some ways, you can buy a small bottle for less than $50 and you won’t be weeping later, presumably, the way you must have over NdT. Also, very wise to wear the sample over the course of the month instead of reacting right away. After smelling it intermittently over 8 months, I feel like I am finally starting to ‘understand’ it-but I can’t help but cringe if I’m wearing it and someone asks “what smells like incense?” Maybe I’ll grow into it one day. You should try small decants so you can get the full experience of a scent (i.e a spray) and several wears out before purchasing (or not purchasing) a full bottle. I’m new here too and have started to order 1.5ml decants instead of 1ml dab samples for those niche scents I can’t find at the Dept. stores. Cost is (usually) about $10, and 1.5ml is enough for the quick sniff or a ‘full’ application. If I just “know” I’ll like something, I’ll up it to 2.5ml or 5ml so I can really wear it – thus making it worth buying more. Case in point, I had a dab sample of Costes 2 from Luckyscent which I really really liked and ‘tested’ several times. I even put it on my Christmas list! I then ordered a 2.5ml decant spray and grew weary (no desire to actually wear it) of the scent so quickly that I don’t know if I’ll ever buy a bottle, but I have enough to wear or sniff if the desire comes back. Yes – The Perfumed Court or Posh Peasant is a great place for decants. Oh, and I agree the NdT is difficult to wear. It was a scrubber (initially) on me but I retested after reading reviews wondering wear the love was and I appreciate it more now. My 1.5 decant is on its way! Thanks for the advice CM! I have only used luckscent, I didn’t know I could buy larger samples (er… decants..?) than the .7ml ones. Am I just not looking in the right spot, or is it only for certain scents, or do you suggest another website? CM, try the Perfumed Court or the Posh Peasant—that’s their specialty (I’m not affiliated). I was looking forward to Violette in Love–not expecting it to be anything breathtaking, just hoping it would fill a little violet niche I’ve been itching for, but my reaction was more like your third one. Might try again sometime. As for the rest of your questions: One of the reasons I’ve never tried to write regular perfume reviews is that it takes me FOREVER to make up my mind officially. Even when it’s love at first sniff, I second guess myself, and almost always wait it out through a sample, and sometimes a decant before purchasing. That’s changed some as time has gone by, but only because I’ve noticed that waiting such a long time doesn’t necessarily guarantee I won’t think it’s a mistake later, so by my convoluted logic I might as well buy and enjoy while I love it, lol. The pace of new releases has affected my lemming birth rate–it’s made it go down significantly, simply because I can’t keep track long enough to work up any anticipation. But I wouldn’t say it’s affected my testing. I still feel like I’m catching up on the last twenty, fifty, one hundred years of perfume, so I’m pretty much permanently behind. I started out behind, and I’m still behind, but there was a year or two there where I thought it was possible I’d catch up. Finally accepting that I’d never even come close has slowly made me less interested in trying, I think that’s what it is. 1. It depends. Since I’m relatively new to fragrance, I’ve been trying to be generous with trying new things, since I’m still learning what types of notes and scent profiles appeal to me. There have been a few times, though, where something about a fragrance has just struck me as AWFUL, and I’ll ditch it pronto. There have been few of these instances though, and the culprit turned out to be violet! 2. I can’t really comment here, since I’m so new to fragrance. I would say that after my first 6-8 months, I’ve definitely slowed down the number of samples I purchase, since I’ve been lucky enough to find several FB-worthy fragrances for almost any occasion. As to more choice not necessarily meaning more happiness its, so true! It lulls you into the idea that the PERFECT choice exists, when in fact that’s not the case 99.9% of the time. I read an article very much like the one you linked in the Economist at the end of December, right after my sister nearly had a breakdown (a slight exaggeration, but she was totally stressing) in a store over which Vera Bradley pattern to buy. A sign of the times! Oh, I will have to look for that article. I find the subject so fascinating. I’ve never gotten over reading a quote from the perfumer Christophe Laudamiel comparing new perfumes to new music — basically saying it doesn’t matter how many, new things find an audience if they deserve an audience, if they’re interesting and made with quality, etc etc. I still argue with him about that in my head, I do thing he’s so entirely wrong. Thanks for that link, Halimeade. I love the Economist! It’s my absolutely favorite current events/news magazine, I wish I could remember to buy it more often. I should just give in and get a student subscription! My husband the AgEcon dude has long held this view. He’s happiest when he can pick from a list of about 8 items. I’m happiest when I can narrow it down to 3-5, then get someone else to make the final decision for me. Yep, I inherited (or learned) mom’s indecisiveness. Ugh. Halimeade – when I was first seriously getting into sampling a few years ago, I wanted to test everything. I figured I was training my nose whether I liked it or not. Eventually I did get to the point where my nose is fairly well trained – not expert by any means. But I can sniff a lot now and pretty much figure out what’s going on with structure, essences, etc. It helps me pick more decisively now the things I want for sure. And I still test stuff I think I won’t like. Case in point is the Nuit de Tuberose which I should hate, but I ended up really liking. The reason I mention this is that you seem to have a pretty good notion about the whole process. Even smelling awful stuff is still training for the nose. And, I often think that violet smells plasticky in fragrances too. Ahhh, good questions. I don’t strike off any fragrance until I’ve had at least a full day of it on skin. There are things I just know I don’t like, and they get no second chances. Things that I find dull or I don’t feel strongly about I tend to give one or two tries, and anything I think I love or think is very unusual gets as many tries as it takes! But I try to leave a month between first sniffing anything and buying it, to see if we really have a chance at a lasting relationship. My answer to question two is really that I’ve only been around in this world for the last year or so, so I’ve never known any different, but the huge amount of choice does mean that things that don’t make an impact (e.g. yet another dull aquatic citrus) simply don’t get second chances. I worry about the “make an impact” part — that perhaps things that are simple, basic, yet beautifully done, will not get the attention they deserve from me because they’re not weird enough to make me stand up and take notice. Hi Robin. First things first: I wonder when that 20ml Paris will make it to the USA if the UK sites are stating a January 30 launch. Then again, might as well buy the 30ml no? Also, Balkis is still on BeautyHabit and now I’m wondering if I need a backup bottle. I don’t know why I’m so smitten with that. 1. How many times do I try before I give up? 2. Have my testing habits changed? I actually find myself going about this hobby with more ‘sangfroid’ these days … I cannot get worked up about most new releases and anxious to try them all the minute they come out. I realize that even if I don’t sniff the newest whatever right this minute, it’ll still be around in a year. Sure, I’ll do sample orders that include brand-new items, but I just feel less ANXIOUS about it all and I don’t jump into feeding frenzy mode about the latest greatest thing. It’s like getting to that point where you realize you’ll never read all the books or see all the films you want to see before you die, so just relax a little. Thanks for the review of Violette. I can’t even remember if I have a sample somewhere, but I don’t think I do. I like hearing about your process of going back and forth: not caring, liking, not liking. It’s interesting how that happens. Joe, I don’t know, and I also don’t know what it will cost. And how much I maybe just want it because that’s a darned cute little bottle, and I love the idea of 20 ml? So we’ll see. On #2, the brand I notice this most with is Serge Lutens, esp with the exclusives — if it’s hard to get, I’m WAY less interested than I used to be. There was a time I would have moved heaven & earth to get the latest SL exclusive, now, hey, whatever. If Boxeuses ever comes my way I’ll try it, otherwise, I’m sure I’ll live. And pretty sure I never tried the one before Boxeuses, and now I can’t remember what that is. So apparently I *will* live! Oh, and ditto on the books!! I used to subscribe to all the book reviews, and eventually I couldn’t take it anymore. If I’m trying something in a shop it will be just once unless it gets a lot of love here in which case I will try again (as with Nuit de Tuberose for example). Otherwise if I’ve purchased a sample I will normally try it 3 times to try and come to a decision, writing down my impressions each time. I have perservered with many scents I didn’t like first time round because of praise by people I admire (ISM, L’Heure Bleue, Bandit) but I’m trying to let go and move on a bit faster now. As odonata9 said above, being a relative newbie I just can’t go through all the classics and keep up with new releases at the same time, so rely on you guys to point out the good stuff! Also I think that as time goes by you’re bound to make your mind up quicker, plus you probably have a large collection of stuff you love so it’s only natural that you’re not going to want to spend a lot of time testing each new release. Many it’s part of the natural progression of the perfumista? Tortola – My first year getting into fragrance I spent a lot of time getting samples of the classics. I found it to be a nice controlled exercise in learning about the greats, esp. the ones that are getting harder to find. It was also a good way to train my nose and learn about the evolution of fragrance. I still care more about sniffing classics than I do about getting to the new ones. I figure the new ones will be around for a few years yet, and those classics are hard to get! I’ll try almost anything a few times, just because, and I keep everything for “reference,” even stuff I hate (yes, my sample stock is over-flowing). Unless of course it’s a scrubber, then I bury it in the back of the reference box. I don’t commit to buying anything until I’ve drained a sample (or split/decant), except in the case of my occasional un-sniffed buys! Mmmmm. No. I only really hear about things through what other bloggers are writing about, and don’t pay much attention to the rest of the noise. My sampling process is a balance between new releases and oldies, skewed towards oldies. … And this year I’m focusing on the indie perfumers, so there’ll be fewer new releases entering my home this year! I keep way more samples than I used to…unfortunately, many times I find they didn’t store well. uh-oh… I guess then that I should use up those Amouage’s! It’s true…don’t count on your samples still being good in 5 years! Some will, but some won’t. I usually try things a few times if I am not sure. If I don’t like something I may try it once again just to make sure that I was not having an off day. If I like something, I try it several times just to make sure, before I buy a bigger decant or a bottle. Sometimes I buy decants blind, if it is a house that interests me or if I have read reviews that intrigue me. As to question 2, I cannot possibly keep up. In fact, I feel pretty overwhelmed with multiple issues from the same house. I have not tried any of the new Diors and I don’t see me trying them in the near future. By the way, I loved Violette in Love so much that I bought it on the spot at Luckyscent the first time I tried it. I split a bottle with a friend. It just seems like a happy fragrance for Spring or Summer, maybe a little young, but lighthearted, and sometimes lighthearted is just what we need. (At least I need lighthearted now). I am ignoring those Diors too! Easy enough to do, since I’m not likely to see them anywhere. Glad ViL has a fan! 1 – Assuming you don’t make up your mind right away, how many times do you try something before you give up? 2-3 times is probably the average. Obviously, Instant Love and The Absolute Scrubber make it easy. The rest (which probably accounts for 99% of what I try) gets tested once or twice again and I either decide that it’s Meh to be passed on or Nice Enough to keep and use up the sample but not FB worthy. I often like to test things in different setting and at different times of year so the two wearings could easily be 6 months apart. 2- Have your testing habits changed as the number of new fragrance releases has risen? Not really. There’s just no way I can keep up with new releases so I sample what I can when I can. Sure, some things sounds more intriguing than others so I might put a little more effort into tracking down a sample but other than that I try to stay Zen about it. Yes, testing in different seasons is also really helpful, assuming you can pull it off. I used to do that more than I do now. In the last year I too have slowed down smelling new things just to stay up to date. I still do that, of course, but when the time feels right and for things that somehow grab my attention. That said, I usually give another shot to something when I happen to read a rave review or maybe when a fragrance comes back to mind because I’m digging a certain note. And it’s awesome when you get surprised and contradicted. It recently happened to me with Etat Libre d’Orange Like this. I found it nothing special last spring and then, a couple of weeks ago, I believe after rereading Angela’s review, I suddenly loved its peculiar coziness. This happened to me recently with Micallef Note Vanille. I found it boring the first time out, but we became friends at our second meeting a couple weeks later. Sometimes it pays to revisit. I test it once, and if I don’t like it, I usually move on. There are so, so many releases, and I have so, so little money, that unless I love it right away, I tend to move on. And, I could now love it right away, but just use up my sample and store the fragrance in my mind until I am absolutely sure I need to purchase it. However, that was not the case with Coeur de Vetiver Sacre. I sampled it one time, just one time, and knew that I had to have it immediately. Also with Panache. After reading your review, I re-visited my sample, and discovered that I was too impatient the first go round. I now love it! If its something i have to buy a sample for, i will probably try it for as long as the sample lasts, and thats it. If its something that can be found in a store thats accessible to me, then i will try it a few times, and decide. If a bottle is forthcoming at some point, i will try it once more before buying, just to make sure it hasnt been reformulated or i havent found something better in the same vein. Yeah, best not to waste samples you’ve paid for, agree. 1. Assuming you don’t make up your mind right away, how many times do you try something before you give up? There are four categories I use to mentally file what I sample: 1) Where can I buy a bottle? 2) Nice, but I’ve got three more just like it, 3) Huh – Maybe, and 4) Oh, Dear Lord, No. If the sample is in the “Huh – Maybe” category, it gets tossed in a pile and gets pulled out at another time of year or when a blogger or poster mentions how much they like it. If I don’t get anything definite the 2nd time around, it’s a goner. 2. Have your testing habits changed as the number of new fragrance releases has risen? It would be impossible to keep sampling new releases while still trying to catch up with the vast number of existing perfumes I want to try. So I’m ruthless about only sampling certain things. I won’t try perfumes from houses or noses that have never worked for me (what are the chances that they’ll suddenly produce something that does?). I won’t try perfumes that focus on notes that have never worked for me (that would be anything focusing on rose, which is almost always soapy/sour awful on me or oud, which makes me want to sneeze). I won’t try perfumes if I could never afford a full bottle (I would end up looking bitterly at my decant and admitting that my mother was right – I should have gone to med school). I’ve cut out probably 1/2 of last year’s new releases right there. Although, that said, I love the PdN line, and I need to try Violette in Love and Kiss Me Tender. With you there… I don’t bother chasing after any Lutens samples anymore. Once in awhile I’ll be curious about one, but unless someone pipes up with “oh, let me send you a sample”, I let the curiosity die. Good idea — not to try things you can’t afford. I ususally try to stick to that rule as well – no sense is heartache and wallet agonies. But I did make an exception to get a sample of Xerjoff Richwod…. It ends there though. I figure if I like it that much I may as well treat it as a 5 ml purchase of extrait for all it cost me and enjoy it while it lasts. My problem is that it’s often hard (for me) to really get a sense of how the fragrance smells from a little sample vial! For a number of things, I ended up taking a chance and just ordering a FB because I was pretty sure I liked the way it smelled, but … the results have been mixed. Fortunately I’ve ended up loving more than I’ve “meh’d”. I generally give a sample 2 test runs (that seems to be the magic number!). As for what to sample – there are some houses/noses I love, so I’ll always try to sniff something by JCE or Olivia G. or Hermes. Otherwise, I am guided by NST, and happily so. I just spoke with an SL rep at Barneys, who told me that MKK and Borneo 1834 are being discontinued, in case anyone needs to stock up! It’s not that they’re being discontinued, they were just only in the export line for a limited time, that’s all. They’ll still be sold overseas. I usually test from time to time, when I fancy a certain note (like you with violets Robin), until my 1 ml sample runs out. The first time I tested Iris Ukiyoe I thought that it smelled like rotting carrots. That was a few weeks ago. I tried it again today and I’m loving the citrus coming off it at this very moment. Hmmm… I don’t know if my skin chemistry has interacted differently with the scent or if I am perceiving it differently, or both? I do find that fragrances seem to change on my skin at different times of the month (and I’m female), despite the fact that some experts say that is impossible. Not really, I buy a lot of 1 ml samples but the majority get one vial sniff or one try on skin and I think “PeeeeeeeU” (Frankfurt Kitchen springs to mind here). And of course, do comment on Violette in Love if you have tried it. I didn’t love it because I thought the raspberry top note was a little too “Jolly Rancher” and there was something synthetic in the dry down that didn’t agree with me, but I can’t remember what off hand. I much prefer Kiss Me Tender. I’m looking forward to your review Robin! I much prefer KMT too! Just last night I re-tested a couple of Ormonde Jayne scents that I had written off as “meh.” To my delight, two I really like (maybe it’s the odd weather we’re having on the west coast), and one is still “meh.” I liked Champaca and Osmanthus so much I even visited the OJ site last night. But cooler heads prevailed. I’ll continue to test these two until my samples are gone and then see if I crave it…Honestly, I check TPC also for slightly larger samples, but the prices knocked me out. I’d rather spend 100 bucks on 50 ml, than 35 for 8ml. It’s true, you never do know: I’ve fallen in love with things months, even years later, that I didn’t like to begin with. Violette in Love has become one of my favorites of 2010. I was looking for raspberry, and found this, and it gives me that dose of raspberry I crave and then it quickly shifts into the violette shimmering feel. However, I understand the feeling that the raspberry is comes off a bit fake. Honestly I haven’t found ANYTHING that the raspberry doesn’t eventually strike me as fake, have you? Hmmm…the raspberry in Balkiss smells just like raspberry jam to me, which , you know, isn’t quite “real”, but it’s realistic. This one, I don’t know…on the off days, it smelled like a bad scratch n sniff sticker. On me, mind you. Ooo – I will have to check that out then, thank you Robin! I’ve gone from trying everything to just concentrating on houses and notes I love…for instance I’m happy with the few violets I have, but anything tuberose and I am still in lemming-land, and quite capable of the sudden full bottle unsniffed purchase! I was determined to get a fig this summer, and found it hard, as I seem to have a love-hate relationship with the note. Then I found the perfect solution in Eau de Italy Au Lac, firstly in a split, and a FB is on the way. Its got a tiny touch, enough to give that summery/aqueous vibe. Hah! I am so there with you on the fig! I hate it hate it hate it…wait a minute…what’s that lovely smell? Thank whatever gods there ever may have been for Pacifica. I dont usually test many new fragrances, there are just too many and all so similar, I try and test anything that sounds unique- rare! They are all too similar, it’s true. 1. I like to be able to test a perfume 2 or 3 times before making up my mind. To this end, I have taken to buying 1.5 ml samples, as the standard 0.7 ml or 1 ml vials only last me for one wearing. If I am not sure, I may put it aside for several months, as things can be very different in “winter” here than they are in the broiling heat of summer. For example, I first smelled Champagne de Bois in June, and thought it was very nice but not earthshaking. When I tested it again in October, it floored me, and I am just waiting for the cart button to come back up to buy a FB. Also, if I am trying to decide between several similar scents (several incences, for example, or several roses), it helps to try them side-by-side in different combinations to help me decide which I like best. 2. I have only been seriously delving into niche/indie perfume for less than a year, so my sampling habits are still evolving. I don’t worry at all about trying everything, just the things that sound most interesting or that get the most raves or that sound as if they would fill a void in my collection. 3. I do have a sample of Violette in Love, and did not care for it. I thought it was very similar to l’Artisan’s Verte Violette, which I also disliked. It really doesn’t smell like violet at all to me, or at least not my idea of what violet should smell like. I always forget about Verte Violette, although I don’t dislike it really. 1. I try everything 3 times before giving up, though I do sometimes make exceptions. There’s only a few I suspect I might like more as more time passes, anyways, and I figure I can always get another sample of them later on. I like the idea of being ‘haunted’ by a scent and of wondering how I’d like it now, after I deemed it FB-unworthy after 3 tries… Zagorsk, Chene and Philosykos are the ones I keep thinking about. 2. My testing habits have changed as I go along, though I’m about a year into this hobby so I can’t remember the days when there were fewer new releases. I no longer feel the need to try new releases that didn’t get good reviews just out of curiosity or because I can get them free at Sephora I’d rather ask for another free sample of something like Coco, which I like but not enough to get a bottle, or a Burberry or Chloe that I used to wear and that holds sentimental value but isn’t worth getting again. I still get excited by any new releases from Serge or L’Artisan I make an effort to try the new ones if they’re from a house I like, or if they’ve gotten a good review, but I’m fine with the fact that I’ll never catch up… I’d rather really get to know a classic Guerlain than sniff 5 new releases that I’ll forget about next month. Trust me, it was easier when there were 500 a year instead of a 1000! At least, it was doable — out of the 500, you could try all the scents that really mattered, or might matter. I’ve gotten to the point where I can just tell if something is not for me. Still, I’ll usually give a perfume a couple of tries. I only purchase samples of things I think I’ll like. The season can affect my reaction, so if it seems more like a summer perfume I’ll put it away if it’s winter. My Evil Scent Twin becomes the recipient of my cast offs. I keep a lot of samples, however, for reference. The number of releases doesn’t affect me too much. When I first started out I was mostly interested in trying things that had been around for a long time and were well regarded. Then I went through a phase where I tried a lot of new releases. Now I’ve come to the point where I’ve got a lot of perfumes I love to wear. I enjoy reading reviews of new releases on the blogs but I only want to try the ones that sound intriguing for one reason or another. I’m not adding anything new here, but you did call this a “poll”, so here is my vote. Lucky you, I think I will never get to that point, at least, not with any huge accuracy. I’ve gotten really tough. I’ll try many samples, but right after that–if the sample doesn’t please me, it’s over. If the sample is great, I’ll order 2 samples. The 2 samples have to please me through the whole run of notes. I no longer buy anything if I don’t like it top to bottom. I no longer buy things that are “clever’ or “incredibly well made” unless I also love it. A “maybe” is a “no.” I spend a lot on samples, but a LOT less on full bottles. Whenever I get interested in something, I want to know all about it, and that’s where I am with perfume now. I tend to throw caution to the winds and order dozens of samples, and easily succumb to odd vintage bottles on ebay. It IS scary to think how long it would take me to test all of them more than once, and I do feel guilty when I neglect them. On the other hand, it reassuring, too, like having a library. My natural tendency is to test something only once if it does not grab me immediately, but the seven-day signature scent challenge on Perfume Posse proved to me that I shouldn’t do that. I chose BK Liaisons Dangereuses because it had seemed merely pleasant to me on first test, but Denyse had given it a wonderful review on Grain de Musc, and I loved other Calice Becker Kilians. Sure enough, I fell in love with it during the more focused test. I think the change of seasons helped, too – one more major reason to retest at a later date. Aside from the obvious extreme types, the right season for a scent isn’t always obvious. In the spirit of giving scents more of a chance, I have started to order up 5-ml decants of scents that are well-regarded by reviewers or other commenters whom I trust and that come from a house or nose that I respect. This allows me to really wear something before deciding on a FB or larger decant, or to revisit in the future. I’ve worn Violette in Love a couple of times and really like it. Now I’m wondering if it just smells different to my nose, or if I will change my mind after wearing it more. We’re not scent twins, even though your perspective is one of the ones I value and I always try to test scents that you really like, so only time will tell. I’m old enough to remember when there were a lot fewer choices, and I can certainly say that even though I tend to retain enthusiasm for new things, there was much greater delight then. I also lived in a country ten years ago in which very little was available and there wasn’t much to do, but there was as much as I had time for, and I understood for the first time the Puritan saying that enough is as good as a feast. (I hope I can recapture that feeling to adapt to retirement, LOL!) I choose to opt out in some ways, e.g., no television, avoid going to the malls. Yes, for me there was special delight then, with fewer choices, and looking back we had to worry less about the crappy stuff is now being chucked at the market in the hope that something will stick. The first perfume that you were given as a young woman, or that you bought with your first pay packet, was quite special. Still, there is SO much more information out there nowadays, and it is so much easier to try before you buy. I can spend my money much more wisely now. And I am NEVER intimidated by SAs now. Remember when it took some guts to walk up to the Estee Lauder or the Chanel counter to pick up a tester, or – even worse – actually ask for a price on something? All over now. Those people have a tough job now to sell stuff to savvy customers who know they can go home and probably get the same product much cheaper online. So interesting that you said the right season for a scent isn’t always obvious — I think that’s absolutely true. Also often find things that bore me inside in a/c “bloom” outside in humidity and fresh air. I agree with that too. Two of my favorite off season scents are Magie Noir and Parfum Sacre in the summer – just a wee dab smells amazing in humidity. I also just discovered that AG Ninfeo Mio’s green ivy “boxwood” thing smelled terrific over the Xmas holiday. I have to try those in the summer! 1. It usually takes me twice to decide I really, truly, dislike a scent. I frequently like something better the second time I try it. If I really like it, I *always* use up the sample – that usually eliminates that scent from my “want” list. The longest I ever tested something, though, was Apres L’Ondee – first time I tried it, I hated it. I kept re-testing every 6 months, went from dislike to finding it “interesting,” and then finally, found it “gorgeous.” If it hadn’t been for its reputation, though, I would have given up on it after the second try. 2. I order lots of samples, but the number of releases doesn’t affect me so much as reading reviews. If you do not like raspberry, I’d say this one is pointless for you. 1. I usually know from the first testing whether I like or not a perfume and I do not wait for the middle and base notes to appreciate my perfume. I should like all stages in my perfume before I buy so if it fails during the opening, then its a NO BUY. 2. I am way, way behind the new releases but that is ok with me as I want to do things at my own pace. But I do keep a list of “must try” (based on reviews) inside my wallet. If I ever visit a department store, I check the list and do some testing. Interesting, people care more about the top notes than I would have thought. I honestly don’t think I’ll ever stop testing Vanille Galante. I’m sorry I swapped away my 15ml of it because how can I wear it again? Maybe in my next travel set. xD But generally, as long as I still have a sample of it. If I still haven’t made up my mind (and I have to order another online) and I run out of free juice, I probably won’t pursue it. And yet…. I hope you’ll love or hate VG eventually…hate to think of you testing it forever! I went on a violet quest a couple months ago and ordered about 10 violette / powder scents – Violette in Love was one of them (and I’ve re-sampled as I write this!) The main problem for me was that none of the violet scents compared to SL Bois de Violette, which I find very cold, icy even, and completely wonderful – definately a summer scent for me. It’s rather magical. Violette in Love is sweet and pretty -not powdery enough, not stark enough. It was better than some… the sample remains in my sample box for another try, but I wasn’t wowed and I didn’t go scrubbing. At some point – usually 2 tries and a day of wear, I’ve selected my favorite(s) of the samples and they all go back in the ‘sample box’. The LOVES are on the FB list (or I’ve already ordered!) the HATES are in a special box which I occassionally revisit, and the rest (loves and meh’s) are filed with other samples/decants. When I get dressed, I choose from my sample box (usually 1.5ml decants these days) or my FBs. Sometimes I reach for the same decant over and over again (like Dzing) which I really didn’t love at first spray and now, well, there’s a FB on my dresser). Sometimes a scent is interesting enough to keep grabbing my attention even though it wasn’t love at first sniff. I also like to retry a scent after reading a review to see if I agree and to see if I like (or hate) it in the same way. Nuit de Tuberose was like that – it was in the scrubber box – and I retried it after reading all the 2010 Best Fragrances. I liked it better (maybe because it wasn’t on a handful of other scrubbers) and ordered a 1.5ml decant so I can give it a proper try. I also retried Vamp a NY as well – not a fan. Tuberose is just a difficult note for me. 2. Has my testing changed? Yes! I’m new here and started off with dab samples, mostly from LS or BH, and I ordered a few bottles that I liked until I realized I couldn’t afford everything I liked. Sooo. I started ordering 1.5ml decants instead so i can try them for a few days. A spray is much better way for me to experience a scent anyway. Now, rather than rushing out to buy the FB, it goes on a list and I continue to use the sample decant until, well, I have to have a bottle. I spend more money trying stuff (I’m still new, still exploring) but after a few likes not loves bottles, I’m more selective, and I definately wear the FBs I own quite often. Lucky for my wallet, I have never loved the SL Bois de Violette, although it’s certainly a must-try for violet lovers. late to the party. . . . I tend to be decisive about most things in life, and perfume is no exception. I try it once. If I like it a little, I try it twice. That’s it. There are too many perfumes still untried, and too many perfumes in my cache, to waste any time on things that don’t appeal. I have at least a dozen scents that I passionately enjoy. I have, perhaps, three dozen more that I like. It’s enough. My testing habits have changed in that I am more sure of my ability to make choices re the like/don’t like. Early on, if “everyone” raved about a scent, I was inclined to keep trying it to convince myself I liked it. No more. Smell. Decide after 2 tries. Move on. Pennies are scarce and the truly lovable or even decant worthy are even more scarce. I just don’t like most scents enough to want to own them. You are way more decisive than I’ll ever be! I still find that it’s worth trying something twice, unless I find it truly bland the first time. But I don’t often try something more than twice anymore, unlike in my earlier days of discovering perfume. It seems I’m getting more and more into appreciating what I already have and love (I pull out old favorites frequently these days), and am a little less desirous of more choices these days. I have to remind myself to pull out old favorites, but still, I do it when I can! I also probably spend more days not wearing perfume than I used to, and I think that does help too — appreciate it more when I wear it. Hi Robin: Interesting post. My habits have changed as time has gone by mostly because I have a pretty nice collection now and am pickier about decants and FB I pick up. I normally test something 2 times if I think it is true love. But I am on a kind of dampened spending mode now, so I end up waiting a few weeks anyway if I do buy something. That kind of puts the breaks on infatuation. If I am on the fence I’ll test out the entire vial (happened with Prada Eau d’Ambree which ended up failing in the end by a small margin for a FB). I tend to keep my sample vials – some are a reference collection of classics and some are ones I’d actually like to get rid of b/c I know I’ll never like them. I do on occasion revisit things I tested long ago to see if I like them or my nose has changed. Once in a while I’ll change my mind about something, but not very often. It’s not hard for me to avoid new stuff b/c I have to seek out all the fragrances I test through purchase or swap. I think it would be a lot harder if all this stuff was being sent to me or I was closer to a good shop. I’d feel overwhelmed too. Some of the charm would wear off as well – I love the hard to get/wanting/ “hunt” aspect of collecting fragrances. Yeah, I miss the “hunt” aspect — I don’t really obtain that way anymore. If I am going out of my way to obtain something now, it’s probably for NST, which just isn’t the same thrill as something I’m dying to try just for ME. Maybe 3, 4 times a year there’s something I really feel I *must* get for ME. 1. Depends very much on how fascinating I find it. Some things I keep trying over and over again, five to ten times or more over a longer period, others just a couple of times. If I have tried something several times and gotten very mixed results I often let it rest for several months or years and return to it later. 2. Not really, I have never felt the need to try anything even approaching everything. I do spend more and more time testing things, but the fragrances I already own and love come first. I am very slack with testing new things, as a rule, and I’m still slowly working my way through the classics and niche mainstays. Oh dear! I missed an interesting topic. 1). I will try a few times, ususally spaced a couple of weeks apart. I have also learned the seasons and body temp play a big part, so I will wait to try in another season. I try at least twice in 2 seasons, sometimes more. UNLESS, of course, the sample was dumped in my Pain pile. I might venture back to that pile, gingerly pick up the vial to see if just reading the name evokes any shade of the previous response. If I tear up, stomach flips – no, back to the pain pile it goes. If I get no physical response, I’ll move it to the “try from a distance pile” and try it in another season, very, very carefully. I found 2 that made it out alive from that. Still not FB though. No more unsniffed FB’s. Although I am toying with the idea of Mary Greenwell “Plum”. hhmmmm – Nope! Must be firm! 2). Now for testing habits….I suppose they have. I don’t know if it is due to the rise in nsamples available, or due to learning some lessons. I find if I go to department stores now, I do it with a mission in mind and baggies in hand. I will get paper spray samples of specific ones I want to try – based on reviews – and plop them in the zipable baggies. I start from there. If, during that day and the next, I like the different stages on paper, I will venture out to get, no more than 2, samples sprayed on skin, while trying to talk my way into getting sample vials as well. After I find out how my skin handkes them, then I decide if I want to buy or not. 3). I have tried it. The first was in the summer on a very warm day. I was disappointed in the result (see above = Pain pile). Reading your comments, I wondered about my sense of smell (yet again! sigh!) so I tried again this morning and, wonder of wonders, it smells really nice. Not the first time I have wondered if “words” have a larger impact on my senses than just a gentle nudge. Then again, warmth sometimes is good for a scent, Maybe not so good for others.